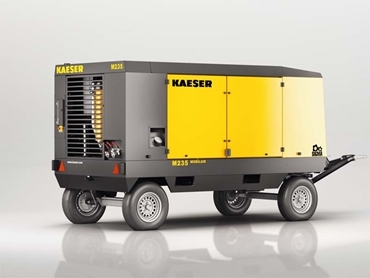 Kaeser Compressors announces the launch of a new range of portable air compressors designed for large compressor applications such as those on mine sites. Mobilair M235 is a new diesel powered air compressor featuring a rugged design to suit continuous site operation under tough environmental conditions. Part of the renowned Mobilair range of portable compressors that are manufactured at a state-of-the-art production facility in Germany, the new M235 from Kaeser operates under extreme conditions, dependably delivering the required compressed air even at altitudes of 3000m above sea level or ambient temperatures up to 50°C. Additionally, the powerful combination of the highly efficient Kaeser Sigma Profile rotary screw compressor block and an energy-saving 194 kW Cummins engine provides impressive performance and fuel efficiency. Key features of the new Mobilair M235 diesel powered air compressors include high performance Kaeser rotary screw compressor block equipped with flow-optimised and energy-saving Sigma Profile rotors; energy-efficient Kaeser Sigma Profile achieving power savings of up to 15 percent compared with conventional screw compressor block rotor profiles; building site chassis with steerable axle and foldable tow bar, combined with a parking brake ensuring secure positioning of the compressor; and recessed lifting eye and forklift pockets for ease of transportation. The Mobilair M235 offers assured frost-proof protection even in extreme cold conditions thanks to the compressed air aftercooler. A generously dimensioned fuel tank ensures sufficient fuel for an entire work shift without any need for refuelling; the fuel level can be seen at a glance on the analogue fuel gauge; and automatic shutdown feature is activated at low fuel levels with a pre-warning from the Sigma Control Smart controller providing additional peace of mind. The M235 portable compressors also feature safety air filters as standard with their optimised design considerably enhancing reliability and service life. The filters can be changed on-site quickly and easily as required. All Kaeser compressors including the M235 are designed for simple user operation and easy servicing. Equipped with the Sigma Control Smart controller protected by a durable metal cover, the compressor can be operated with just three buttons. The monitoring system can automatically shut the compressor down if necessary or report maintenance requirement. Key advantages also include long-term corrosion protection for enclosure components thanks to high quality zinc priming and tough powder coating; large enclosure doors providing easy access to a well-designed interior; and quick and effective service and maintenance facilitated for maximum efficiency and compressed air availability. The M235 is available with a certified spark arrestor for refinery applications. In addition, the engine shut-off valve automatically shuts down the unit upon intake of combustible gases to ensure maximum safety. Also recommended as an ideal back-up air supply solution for industry, the Mobilair M235 can be supplied in a skid mounted version for stationary applications. A wide range of optional compressed air treatment components allows the M235 to deliver compressed air at the required quality at all times. The Mobilair M235 is available in a choice of models featuring various pressure versions ranging from 8.6 to 14 bar, with free air deliveries from 18.1 to 23.3 m³/min. For more information, please visit www.kaeser.com.au or phone 1800 640 611.